A multinational manufacturer originally selected a European supplier to produce newly designed drive housings, but after several months of production difficulties delivery requirements were not met. A high rejection rate due to inconsistent weld quality threatened the cancellation of the customer’s multimillion dollar contract. 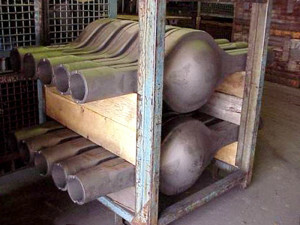 The client decided to “reshore” production back to their U.S. facility. But in order to do that, they needed a supplier with proven commercial capabilities and robotic welding assets, to immediately function as a layered capacity supplier in order to fill the shortfall while a new production line was being built. This was a difficult project due to three different weld specifications within the length of the assembly. Inconsistent fit up created a large challenge. While an optimal weld joint gap of 0.060” was appropriate, the actual gap ranged randomly from a max of .139” down to .010/” The parts were too thick / strong to reshape by merely using clamping within the robotic weld fixtures. We accepted the technical challenge and quickly develop extremely creative weld techniques to solve fit-up problem. Within three weeks we designed and build weld fixtures, programmed a dual arm robotic weld cell, validated the production process, and achieved PPAP. Our participation in this program lasted three months. All production delivery goals being met, without a single rejection and our customer’s contract was saved.